"Stop Speeding Yanks!" "Slow the f#*k down!," "Go home!" Something about the 2009 Subaru Impreza WRX makes you want to speed. And here in Canada, where they take the law literally, blatantly flouting limits really stands out. Of course, something about the WRX will always sit uncomfortably with the surrounding world, no matter the pace. While it's been modified for 2009, just one year after its launch with 41 more horsepower, stiffened suspension and STI-esque bodykit, it remains one of the ugliest cars on sale. Of course it's another kind of ugly people are concerned about today. 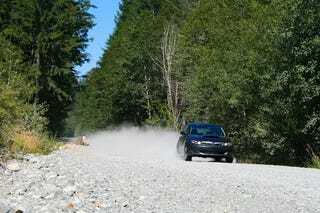 Heading southwest down a remote road on Vancouver Island in an American-plated WRX, I'm not exactly behaving like an ambassador for my country. These are some of the most challenging roads in North America, winding their way through the coastal mountains along ancient logging trails, the road bears the ravages of harsh winters; its two lanes rippled, rutted and patched beyond repair, concrete barricades serving as buffers when the going gets too rough. Unlike the firmer, louder and more focused 2008 Subaru Impreza WRX STI, the new 265 HP WRX eats all this up. As untroubled by the bumps as it is by the limited passing opportunities afforded by the few straights — after all, double yellows are just lines painted in the road — it leaves law abiding traffic in the wake of its new, louder exhaust. A year ago this wouldn't have been the story we would have written. A competent but uninspiring drive, the 2008 model forsook performance for practicality in an attempt to broaden the brand's performance appeal. It didn't work, the WRX's traditional focus and involvement were mistakenly left out, resulting in a car that alienated its core audience while retaining enough awkwardness to miss the mass market, too. That car lives on in the form of the 2009 Subaru Impreza 2.5 GT, a car the company expects to make up only a small fraction of Impreza sales. Meanwhile, the WRX has been rethought from head to toe. Gaining better judged, firmer suspension all-round, thicker anti-roll bars, STI seats and most important of all, an STI-spec turbo. The WRX now hits 60 in 5.4 seconds before reaching 140mph (limited) and will retail for "under $25,000." All of this works to create a faster, better handling, more controlled car that encourages the kind of three-figure, "sure, we can make it" passing that's proving so unpopular with the locals. Stopping for a quick opportunity to mark my territory behind a tree, the 10 cars that were just passed all at once get a chance to catch up and let me know just what they think of my bad behavior. I probably shouldn't have passed them all again within the next mile, but then America's honor was at stake; we do have a reputation to maintain. But it wasn't just passing for passing's sake. My assholery had a purpose: to find corners unencumbered with traffic. Where the STI's suspension only really works on reasonable surfaces and requires a huge amount of belief in the ultimate ability of its vague chassis, the WRX revels in reassurance, never feeling like it'd be possible to run out of grip, even on the worst surfaces Canada could throw at it. You can thank Subaru's Symmetrical All-Wheel Drive for this. Sure, it's nothing new, but unlike both the STI and 2008 Mitsubishi Lancer Evo MR, here it's tuned for the road, not the track. In that environment, it means more speed, more involvement, more fun and an increased propensity to seek out corners with enough room to exploit it. While this on-road ability does lead to decreased on-the-limit track performance when compared to the other cars, it makes the WRX faster, more involving and more rewarding in the environment where it will be driven most. Or here in Canada, where we probably shouldn't drive again for a while.